Merck, still corrupt, and still in Ireland. This week it was reported by Pharmalot that Pfizer has reached an agreement in principle with the US Department of Justice to resolve a foreign bribery investigation. The “potentially improper payments” (Bribes) relate to sales activities in countries other than the US; Pfizer have numerous medications approved by the Irish Medicines Board (IMB) and subsequent numerous “Dear Healthcare Professional” warnings, albeit after the fact, and which include warnings of “Increased Mortality”. Also this week in the Wall Street Journal, it was reported that American pharmaceutical company Merck, Sharp & Dohme has agreed to pay $950 million to resolve criminal charges and civil claims related to its promotion and marketing of the painkiller Vioxx® (rofecoxib). Merck will plead guilty to a misdemeanor for its illegal promotional activity. Vioxx (which was also licenced by the IMB in Ireland) may have led to more than 27,000 heart attacks and sudden cardiac deaths; That’s one big misdemeanor!! $950 million??? O.K, What’s that got to do with Ireland? Before 2009, I was under the (sadly mistaken) impression that Doctors kept themselved informed and had infinite knowledge of what they were prescribing. I was also niave enough to think that pharmaceutical fraud only goes on in the minds of fictional authors, like John le Carré (The Constant Gardener). 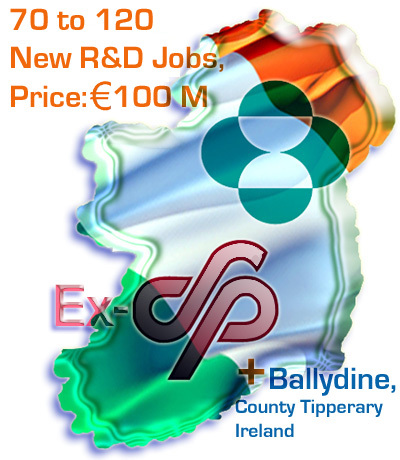 Last year the then Taoiseach (Irish for prime minister) Brian Cowen announced that Merck’s MSD division was setting up its shared business centre for EMEA in south county Dublin. According to the Taoiseach Brian Cowen, the new financial services centre is “a strategic win for Ireland”. The Taoiseach also pointed to the importance of the pharmaceutical industry to Ireland’s economy, which he said “cannot be underestimated”. Don’t worry, I for one, am not underestimating the influence of the pharmaceutical industry in this country. Merck, Sharp & Dohme is no stranger to controversy here in Ireland and has the dubious reputation of losing one of the longest running legal cases in Irish history. Hanrahan v. Merck Sharp and Dohme. This case went on for almost 10 years and resembles a Hollywood ficticious blockbuster. 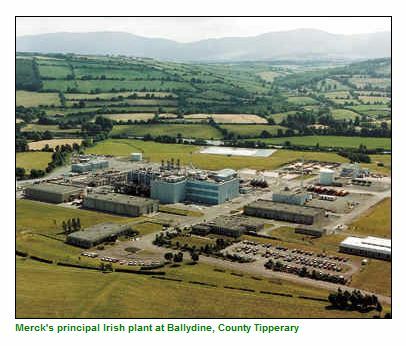 The case concerned John and Selina Hanrahan who had a farm in Ballycurkeen, Co. Tipperary, which was situated a mile from the Merck, Sharp & Dohme plant. The Hanrahans claimed that because of dangerous chemical substances escaping from this plant, they suffered Ill-health, their cattle suffered deformities and deaths, and damage was caused to herbage and plant life on the farm. Mr Hanrahan gave evidence that he began to experience an unpleasant smell in 1979. According to him it was ‘a dreadful smell, a really dreadful smell’. He complained about it to the factory on numerous occasions. On the occasion of one of those complaints Mr. Wyatt, an executive in the factory, said that the waste system had gone wrong. Mr. Hanrahan described the smell as foul and as following him into the house. He said that on one occasion the smell was accompanied by ‘a dreadful burning’ and that his skin was affected. While the case was ongoing, Merck employed a media consultant, Frank Dunlop. According to the Hanrahans Mr. Dunlop started to spread rumours about them. He said that they were killing the cattle themselves by giving them too much nitrogen, that it wasn’t Merck poisoning them. According to the Irish Independent the hurt caused to the family remained a vivid memory. As well as being castigated for their farming skills, they were characterised as anti-patriotic for putting local jobs at risk for the sake of selfish interests. John and Selina both suffered extensive ill health in the 1980s. John’s continues to this day. In the period covered by the Supreme Court decision, they had to move out of the farmhouse to flee the emissions, more than 100 cattle died, an abnormally high number of twin and deformed calves was born on the farm, the children’s pets – dogs, cats, rabbitts, a foal and a donkey – all died, and their grandmother was forced to abandon her beloved vegetable garden when the plants grew to grotesque triffid proportions. Even the ivy curled up and died on the trees. The acid mist that floated down from the factory burned human eyes and skin, leaving John Hanrahan’s tongue blistered and his chest wheezing. Financially, they were on the brink of ruin at the time of the Supreme Court victory. Suppliers had refused to sell them feedstuff because of unpaid bills, the Co-op stopped taking their milk and the local council cut off their water for non-payment of rates. The damages Merck had to pay for ruining the Hanrahans lives was reported to be around 2 million Irish pounds, even with the rate of inflation, Merck got off lightly, so their dirty tactics paid off. Despite their latest fine of $950 million, and the deaths they caused from vioxx, the profits Merck made from selling this drug and concealing the side-effects must have been well worth the risk! BTW, another one of Merck’s medications (Singulair) which is used to treat stuffy nose, sneezing and other allergy symptoms as well as asthma, has also been reported to be associated with suicidal thinking and suicide. Link Merck…..“We have no indication that anything about the mechanism of Singulair is consistent with these events,” George Philip, Merck’s director of research and product development, told the Associated press “But because suicide is a life-threatening event we thought it was important to provide this information in the product label.” Hmm, Vioxx anyone? Next postSuicide, Suicide, Suicide…60 Minutes New Zealand. I read this in bed earlier but now I am wide-awake I feel I should comment. You are right, it IS like something out of a Hollywood movie. The Hanrahan’s case seems strikingly similar to those families poisoned by the water in Hinckley in the Erin Brockovich movie. As i said on another post, pHARMa is the 2cnd most powerful business on Earth. Governments dont have the balls to take em on, if anyone within the profession tries to bring knowledge to light, theyl be, as this poor family were, bullied, slandered, belittled, abused and wont stop at any hurdles. I agree that pHARMa got off lightly the £2m is a pittance to the massive billion upon billions etc that they reap on a continuum. It will never make up for what theyve done to a hard working honest family, their animals and all else, how it lasted so long is a disgrace, why is it there is no further action taken? Because these sick twisted fux, are almost untouchable. They make poison and lie about everything, they are an evil unto themselves that need the karmic turnaround of their cause and effects. Idle but apt poetry, by me. Kill, maim, distort and deform. Another day of evil to perform. no compassion, no emotion, its all in the norm. greek in fact, its clear and bold. metals, chemicals from twisted notions. the evil deciever of all the nations? all in the name of power and greed. What’s a few cattle and a family’s health matter? It’s all about the mighty buck. Frank Dunlop as their pr guy?! That says it all really!! A $950 Million Charge, and a guilty plea to a Misdemeanor. If any private person PAID OUT, Admitting Culpability for 3,468 Deaths, can anyone expect they’d be allowed to plead guilty, to a Misdemeanor? That’s gas, thanks for the comment! You should be very proud, your grandparents took on the pharmaceutical industry and won. In Ireland it’s almost unheard of and extremely difficult. I can’t imagine how hard it must have been for them, to be shunned by the community, bullied by Merck and brought to their knees financially and mentally by pharma corruption and bullying tactics. It would make a great film! Say hi to your grandparents from me – and from all of us who would love to have the guts and tenacity that they obviously did. Mucho respect! Interfloor here in Dumfries Scotland and was accused of all sorts of rubbish.However this factory has now closed here and thank God after all the damage it did. 'Mother and Son' both die by suicide. Claire Peake; Another victim of 'unhappy' pills? Doctors differ and patients die; Dr McManus, O'Brien and Coetzee differed, Shane died.